There’s a flaw in the way Google Analytics measures ‘time on site’: the counter only starts from the second page visited, so all one-page visits are counted as zero time on site. If a visitor comes to your page, stays for 10 minutes reading – and then closes the window… that’s counted as ZERO time. With landing pages that have lots of interaction, or the call to action is a phone call rather than a click, this can be a real problem. The script logs an event to Google Analytics for every 10 seconds the visitor stays on the page, regardless of whether they bounced or not. But it won’t affect your bounce rate or time on site for historical comparison *. We suggest you look closely at how visitors drop off after 10, 20 and 30 seconds to see which of your web content could be improved. 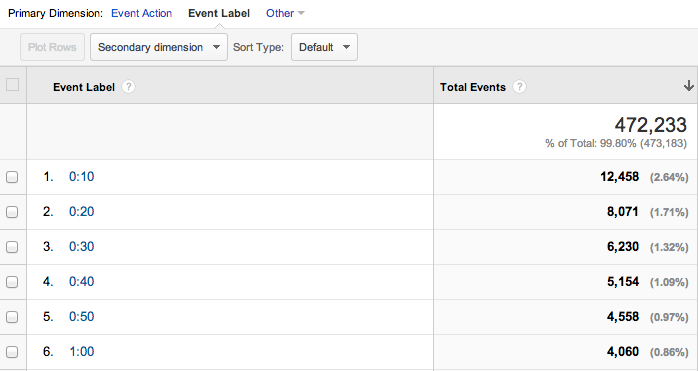 In Google Analytics go to Behaviour .. Events .. Top Events and click on the event category ‘Time’. Searching for a particular time will find all the people who have stayed at least that length of time. e.g. 0:30 finds people who have stayed more than 30 seconds. Does this affect the way I compare bounce rate or time-on-site historically? No. The script sends the timer events as ‘non-interactive’ meaning they won’t be counted in your other metrics. Without this, you would see a sharp drop in bounce rate and an increase in time on site, as every visitor was counted as ‘non-bounce’ after 10 seconds. If you prefer this, see below about adapting the script. Will this work for all browsers? Yes, the functions have been tested on all major, modern browser: IE 9+, Chrome, Safari and Firefox. What if I upgrade to Universal Analytics? Don’t worry – our script already checks which of the two tracking scripts you have (ga.js or analytics.js) and sends the appropriate log. Will this max out my Google Analytics limits? Can I adapt this myself? Sure. The full source file is here. Need more help? Get in touch with our experts!